The cycles I see in my “natural spot” are cycles of insects, birds, “pests,” and plants like planted flowers, weeds and trees. These organisms thrive year-round, however in the winter they go into a resource-conserving phase. They are not dormant but their expression of life is limited. They are much more conservative. Conservation is an important term in sustainability. We tend to steer away from the terms conservative and conserving, but we love the word conservation. Conservation and preservation have been used hand-in-hand and oftentimes interchangeably. These are ideals have not explored or expressed deliberately in my final project in Biomimetic Design, but they are important concepts nonetheless. Though they may echo throughout the functions and strategies used in the Self Sustaining Sustenance Pod, it would be helpful to the project narrative and my design process to explore the ideas in the final design and discuss them explicitly in the design narrative. The most basic and important feature of the sssP is its ability to enclose and those store and protect. This, by nature, is quite conservative and preservative. The secondary sssP feature of water filtration is both conservative as the pod can store the water for drinking or for agricultural usage, and it is also preservative as it is taken into consideration the value of not only water but purified / drinking water. The tertiary feature of sssP is its ability to replicate and / or disperse, or to continue living. It begins as a living, biological creation but it is able to continue living by its seed storage and usage and its bio-based enclosure. Like the box fruit, its shell is sturdy but it is also permeable and edible. Thus the sssP's enclosure, contents and water filtration ability allow it to live again, and possibly again and again. This is not necessarily conservative or preservative, but it takes into consideration life cycles and is thus truly sustainable. In experiencing my natural spot, my backyard, I think my design idea can learn from the way organisms respond to weather and external environmental factors. Perhaps the sssP could go into a dormant state when resources are more scarce. One function it could perform while dormant is passive water filtration, whereby the pod filters water in its surroundings. It also collect solar energy and store it in a battery form while it is dormant / not growing food or being used to filter water for drinking. I'm writing this post after receiving my peer evaluations so perhaps I have a bit of an edge over those who wrote their reflections prior to receiving their peer reviews. Peer review are so helpful in a design project because they are the great equalizer that brings all of our lofty ambitions back down to earth. This reflection is essentially more intentional as I now have some valuable feedback to help refine the design ideas before we move into the collaboration phase. Spring is in full swing in Northern California and that means things are buzzing and chirping and crawling. I see a lot of movement, and this movement can inspire my design project. The project as it stands is primarily centered on an airtight, protective enclosure for genetic information (seeds in this case but could be human or other DNA in another story). This enclosure needs to be able to disperse genetic information, to reproduce if you will, but exactly how does it move? I have discussed it attaching to people and animals like a burr, but what if it moved all on its own? What would that look like? As I write this reflection it is dark outside, but there is still movement from what I imagine must be bugs and rodents. Looking at how some organisms perform their functions at night, while other organisms are at rest, forces me to look at how my project or product might perform when it is not being used. What other functions could it perform while it hibernates, while it sleeps, while it stores seeds at sea? What other passive or secondary functions could my product perform while not in use? Could it tie into the projects of my classmates? If so, how? I think the most strategic passive or secondary function would be to provide energy for other systems, and that is a topic I'd like to explore immediately. It was something I researched and talked about previously, but it has not been fully developed. What other handheld energy harnessing devices are out there? What are they best used to power? How could they be improved? Developing the solar cells in the underbelly (or hat) of my pod would be the quickest way to explore this idea. As I briefly reflect on the last 2 months of the Biomimetic Design course, I try to see the "problem" and "solution" in a new light. Yes, it would be interesting to solve the world's problems with nature, which can treat water and feed us and keep our air clean at the same time. And yes there are food sources that currently exist that can do this! So what if we could program this system for optimal performance, and to be more resilient? By looking at the best natural systems for water filtration, seed storage, human nutrition, agriculture /permaculture, and resilience to natural and man-made disasters, we could design a technical super food product that could solve many issues at once. This issues being water scarcity, water treatment and filtration, food scarcity, food storage, and energy creation / harvesting. These are lofty goals but why not aim high - in the spirit of competition? I have consistently doubted this project's validity, seriousness and viability. I think it's now time to take it very seriously and challenge MYSELF to execute such a complex, multi-faceted design solution. The exciting part about the Biomimicry Global Design Challenge - at least for me - is to design a product that could revolutionize the way we treat the earth, ourselves, and our future generations. In traditional farming, we do not think about the earth unless it has a benefit to food production - whether that is yielding more or yielding for longer. We do not think about other animals unless required to do so by law. Animals include ecosystems that existed in prime farmland, insects and other "pests," and anyone or anything that is impacted by any process, from complex systems like hydrology to simple, logistical issues like harvesting, transportation, storage. So the crazy question is: what if we could design - like a product - a food source that could be flexible enough to serve each human on earth NOW, with whatever regional context and limitations he or she may have, that is also flexible enough to survive natural and man-made disasters? What would this food need to do? What would it look like? Taste like? We are addressing two problems here: resources scarcity in general, and water scarcity more specifically. This is a controversial idea, with the rise of genetically-modified designer foods, and food-like products in a VERY competitive environment, often protected by intellectual property law. Now is a perfect time to ask the questions about nature, science, production and humanity. We have the technology and possibly the intelligence in the design community to foster a conversation this challenging. What are your thoughts? It's Saturday morning and I'm sitting in my backyard with my dogs and my homemade double shot of espresso. I've decided to take the day off, it being Saturday and all. Taking the day off usually entails doing a lot of tasks and is not necessarily a day off, but today involves only a few selective tasks (like this BCI, for instance). Chores, errands and all other mundane assignments will wait till tomorrow. Today is my day of rest, and I have been averaging 3 hours of sleep per night for the last 2 weeks so it is absolutely critical that I "catch up" on sleep throughout the day with at least one nap and as much lounging around as possible, hence the double shot of espresso. Roses have been cultivated for over 5000 years, and some 150 species are currently alive. Fossils from 35 millions years ago have also been found. I’m looking at a climbing rose called New Dawn. I’m looking at it because it needs some trimming, but also because it’s somewhat infatuating. It’s such a wild looking yet obviously intentionally cultivated thing. Rosa New Dawn is a mutation of another climbing rose, but with a much shiner, glossier foliage that blooms in several seasons. For us in California it blooms only in the spring, but that’s plenty. It produces bright red fruit and it’s also very fragrant. 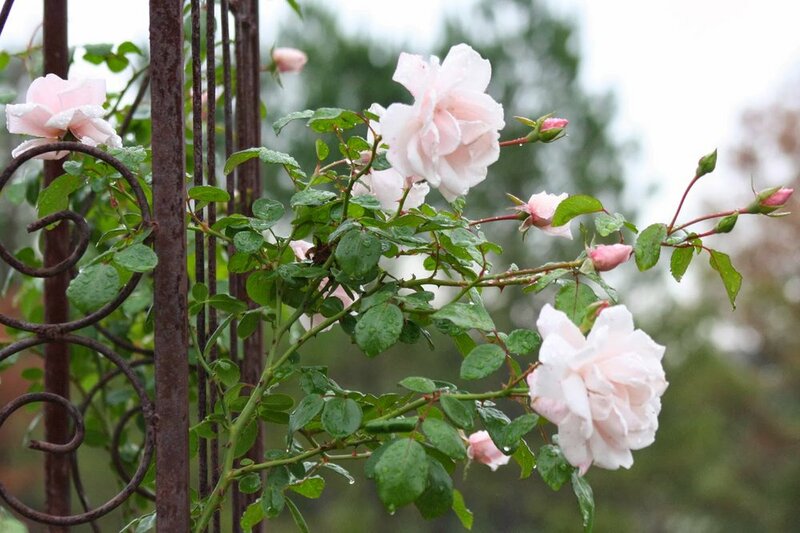 All of these qualities make it a favorite for rose-growers. It’s also a beautiful decoration for (or distraction from) storage sheds and helps the white shed blend into the rest of the garden. The design is that it climbs, blooms, smells great, and is hardy. It also has thorns, like most roses, which prevent some animals from using the plant as food. One technical strategy I’d like to explore for the Design Challenge would be attaching permanently. This strategy is helpful for devices that cannot move on their own and use other things to move or help distribute them. Movement and distributionare critical for dispersion, survival, and ease of use. DATE: MONDAY FEBRUARY 20, 2017. WEATHER: cold, wet, raining, flooding. Solutions mustn’t be complex or hyper performing. Nature can be complex and high performing but it can also be essential and efficient. Your design mustn’t be overly sophisticated or extremely innovative. Nature can be sophisticated and innovative but it can also be unnecessarily complex, able to adapt, to evolve and to vary. The natural world speaks to me. It says simplify. Slow down. Why are you in such a hurry? You cannot beat time, or life, or death. You can be. And you can be a mirror of my simple, clean efficiencies. Take what you need, what serves you best, but give back when you are finished. 1. Lizards are so active when it’s hot. When it’s cold and wet, where have they gone? I don’t see them or hear them. They utilize the sun’s energy for movement in the summer. I think they have so much excess energy that they must need a way to get rid of some of it with their activity. When there’s an abundance in energy sources, they use them. Lizards respond to the energy in their environment. They can even blend in using camouflage. 2. There is a small red barked oak tree that I’ve been mesmerized b for 5 years. Turns out, it’s not an oak at all, it’s actually a Manzanita bush. It offers a fruit, is drought-resistant, and is covered in a unique thick, smooth red bark. The berries can be harvested and stored. Once dried, they can be ground into a flour. They can be eaten ripe for a sweet flavor or green for a sour flavor. The berries can be distilled into a sweetener. The berries and branch tips can be soaked in water to make a cider and Native Americans even used the tree’s leaves for brushing their teeth. They tolerate light or heavy soils. The tree is hardy enough to resist drought and elements as fierce as high-speed cars on the freeway. Manzanita wood is also used for pet birds as it creates ultra long lasting nests. The wood holds up well over extended periods of water submersion. Dried Manzanita wood makes for excellent tinder. From Wikipedia “Some manzanita species are among the rarest plants in the world. The endemic Arctostaphylos hookeri ravenii (Presidio manzanita) is the most endangered and restricted plant in the mainland United States. In 1987 only one specimen remained, at a secret location in the Presidio of San Francisco National Historic Landmark District in San Francisco, California. This plant has since been successfully cloned. Arctostaphylos franciscana (Franciscan Manzanita), a species native to San Francisco, had not been seen growing wild since 1947 until it was spotted growing in the Presidio of San Francisco in October 2009. Caltrans transplanted this specimen on 23 January 2010 to make way for the Doyle Drive Replacement Project. Transplanting costs were funded in part by Federal Highways Administration, Caltrans, The Presidio of San Francisco, and private donors.” Turns out this captivating tree has a rather colorful history and so many interesting uses! 3. Though this material has been explored in biomimicry to the point of being cliche, burrs cover the landscape and my clothes. They are so very persistent and successful. They may have inspired velcro, but did nature design them to be our clothing fasteners? A bur is a seed, fruit or fruiting head that has dry hooks which repel predators and disperse seeds by hitching a ride on animals and people. A large bur known as a teasel, can be used as a brush or fabric fulling tool once dried. From Wikipedia: The genus name is derived from the word for thirst of water and refers to the cup-like formation made where sessile leaves merge at the stem. Rain water can collect in this receptacle; this may perform the function of preventing sap-sucking insects such as aphids from climbing the stem. A 2011 experiment has shown that adding dead insects to these cups increases the seedset of teasels (but not their height), implying partial carnivory. The Texas horned lizard uses the organization of its skin and horn features along with its position to capture and distribute water to its mouth for drinking. It uses the resources in its environment like the sun and insect for energy. It also uses the appearance of its exterior features to blend in with his environment. My product could use its shell to collect rainwater as well, and the shape of the pod could be designed to distribute water to a “mouth” or opening. The material of the pod could be camouflaging so that it can be hidden or go unnoticed, storing seeds in a stealth mode. The manzanita tree is covered in a smooth bark that protects it from damage, possibly even brush fire, and helps it to resist drought. It produces a versatile fruit that can be used for food. Its roots can tolerate light or heavy soil. My design can utilize a sturdy skin for protection, and this skin could shed itself as the Manzanita does for access to the seeds. The skin could regrow itself to self-repair after seed use. This sturdy outer shell could keep water in, keep other elements out, and provide structural protection from exterior damage. A dried pod could be used for alternative energy source by being burned for fire which would provide light and heat. Pods could be farmed large scale for food, and their bark-like shell could be used for a building material, harvested and processed like bamboo. The bur uses its structure to transport itself. It also can collect water and insects. When it collected insects, it was able to produce more seeds. My design could use its structure to transport itself. It could us a burr-inspired apparatus or arm to collect water or other resources it could use for fuel. Reversing or slowing climate change itself (e.g. by removing excess greenhouse gasses from the atmosphere). 1 isolate or hide away (someone or something): Tiberius was sequestered on an island | the jurors had been sequestered since Monday | the artist sequestered himself in his studio for two years. • [no object] Chemistry form a chelate or other stable compound with (an ion, atom, or molecule) so that it is no longer available for reactions. 2 take legal possession of (assets) until a debt has been paid or other claims have been met: the power of courts to sequester the assets of unions. • take forcible possession of (something); confiscate: rebel property was sequestered and a military government installed. • legally place (the property of a bankrupt) in the hands of a trustee for division among the creditors: (as adjective sequestered) : a trustee in a sequestered estate. • [usually as modifier] carbon fiber: a bike with a carbon frame. • a rod of carbon in an arc lamp. • a piece of carbon paper or a carbon copy. 2 carbon dioxide or other gaseous carbon compounds released into the atmosphere, associated with climate change: the level of carbon in the atmosphere has been consistently rising | [as modifier] : fossil fuel consumption and carbon emissions continued to rise. Compounds of carbon (organic compounds) form the physical basis of all living organisms. Carbon atoms are able to link with each other and with other atoms to form chains and rings, and an infinite variety of carbon compounds exist. an instance of resuming an activity or state after an interruption: a renewal of hostilities. 1 in, relating to, or characteristic of a city or town: the urban population. 2 (also urban contemporary) denoting or relating to popular dance music of black origin: a party that features the best in urban music. • denoting popular black culture in general: an urban comedy | urban clothing and street wear. Survival. With great privilege comes great responsibility. Our current political climate has caused a lot of perceived division and argument. Life is not black and white. It’s not grey either. It’s every color of the rainbow and every color the human mind can imagine. As I look over the hills I think how incredible it is to be the descendant of a land owner. It is also humbling to know that many of earth’s inhabitants are not afforded this luxury. I also find it extremely unsettling that I cannot be one with nature and forage for food without complying with fish and game law. If I were starving and needed food, I could not lawfully catch and consume a fish without a fishing license. How can a government own animals or a body of water? Do they own rain as well? Why are wind turbines illegal? Is a grassroots eco-movement lawful? Why or why not? What happens when the political climate is decades behind an eco-movement? Is there any way to be truly one with nature? To be independent? Free? Is all life subject to some form of human authority? Who owns the planet? Socially constructed systems of environmental justice and ecological politics come to mind. I realize, and accept, that in our current location and state, we cannot live or BE without complying with authorities, even though they may not be altruistic, balanced, not-for-profit, or at all ethical. The most inspiring organism on this plot of land are our wild boar/feral domestic pig hybrids. These pigs, known more simply as wild boar, are the now-wild hybrid descendants of domesticated pigs and introduced wild boar. They symbolize all that can be wrong in man’s tampering with nature. A mirror to the western Mustang, they are evidence of modern civilization short attention span and lack of compassion for life. These pigs are hyper intelligent and adapt to hunting pressure quickly. In my experience and opinion, they are better at survival than we are at controlling them. Private land owners have gone to great, unethical lengths to control their populations. Somehow this accident of a species hybrid has overcome wilderness, domestication, and hunting. In the spirit of caring for and nurturing the earth, I look to our indigenous ancestors for ideas about balancing civilization with nature. This makes sense contextual as Native Americans cohabited with nature before the settling and founding of the United States. Idea 1: Calcium oxalate formation carbon sequestration in building materials. Idea 2: Explore a mechanical system that utilizes green algae for energy, water treatment, and carbon sequestration. Idea 3: Incorporate wetlands into site strategy as transition/buffer and natural barrier. Idea 5: Utilize red algae for water treatment. Alternatively, explore multiple water treatment strategies with site geometry and multiple algae species. Idea 7: In eco-cement, CO2 is trapped within the cement when it mixes with added magnesia. This creates magnesium carbonate, which adds strength to the material. Idea 10: After exploring the preceding 9 strategies, it would be interesting to explore a home and site that incorporates multiple, inter-connected, inter-dependent strategies to create a living home that functions like a natural ecosystem. Exploring ecosystem typologies could be a start for a framework that aligns with existing frameworks and building rating systems. This would somewhat marry biomimicry and a rating system for the ultimate hybrid in bio-inspired high performance tools. "Identifying unique leverage points for change, removing barriers to the adoption and spread of existing solutions, and/or clearly demonstrating how biomimicry can lead to new, novel, or more effective solutions." S.C.R.U.b. = Sanitize, Coalesce & Restore Urban balance. This is really rough, but stems from a week long working group with my teammates. We're entering the Biomimicry Global Design Challenge! Group Idea: "Building concept that captures, purifies and recycles water." Individual Focus: Mechanical, Structural, & Architectural solutions & schema, at single-family & urban scale. Also looking at modes of connectivity. Mechanical: biomimetic waterproofing of structural skins, porosity studies, exploring porous materials vs. waterproof/water resistant materials. Concepts: Lignin, butterfly wings, basalt. Organization: Nesting, networks. Concepts: Tributaries, ocular blood vessels. Scalability: Fractals. Concepts: Snowflake - Koch curve. Movement: Swarming. (Like breathing - cyclical.) Barnacles. Thoughts? Concerns" Secrets? Desires? Resources? SHARE! DATE: SUNDAY FEBRUARY 5, 2017. LOCATION: BACK YARD, UNION CITY, CALIFORNIA. Resilience: ants in my neighborhood are so resilient. We keep spraying them (true story) and they keep coming back. For a few years, they were so intent on coming in from every opening that if the weather changed, if it rained, if any food were left out, they would take over within minutes. I haven’t seen any in awhile but their resilience and tenacity has always amazed me. Optimization: Rose bush. A few years ago we planted a rose vine (new dawn climbing rose) that we were hoping would beautifully frame our shed. Within a few years it completely overtook the shed and though it was beautiful it was a high maintenance mess and was impacting the structure. We had to cut it back quite a bit, and it’s much more manageable now, but it was amazing to see how quickly it took over, how much it grew, and that it would not stop until it had destroyed the shed if we had not trimmed it down. Adaptation: Skunks, possoms. We have a pesky skunk infestation in the area. They seem to burrow under the shed no matter how many bricks we lay in their way. In addition, we have some territorial possess that like to have babies and raise their young under the shed. They also like to chew our metal grates and get into our crawl space and make creepy noises all night. They’re nocturnal so they stay up all night making their little homes inside and underneath our home. We have trapped over 10 possums, all of which were very young. We haven’t trapped any skunks in years. They’re outsmarting our fig newton traps. Systems-based: Birds. Birds in the area pretty incredible. We have a lot of jays and song birds, and I’ve even spotted a mated pair of Ravens that lived in some trees in an unused lot behind our yard. Birds are interdependent on all other ecosystems, they migrate, they utilize our roofs and trees as homes, use trees, fences, houses, as places to attract mates. Values-based: As I sit here reflecting, the one thing I notice most is the wind. In particular, the sound of the leaves rustling in the trees and the wind chimes. This sound is a powerfully soothing sound as it embodies the impact natural elements have on man-made elements. It's a subtle reminder that no man-made or natural element is free of natural impact, whether it be from wind, weather, or simply time. I also here cars driving by, and that reminds me that no system can escape man's mechanical footprint and noise. We are a busy little species, and even when we're quiet, nature is busily at work as well. Life-supporting: dog. Dogs are pretty darn special. We’ve domesticated and bred them to be safe, trainable, obedient companions, that rely on us for al food and shelter. My body puts up with a lot of pressure, stress, and abuse. From weight training, a demanding, stressful job, commuting, being on my feet all day one day followed by sitting at a desk all day the next, and then filtering out pollutants and toxins, (including cosmetics) insane amounts of caffeine, small infrequent doses of alcohol, my body just keeps on going! It is resilient, interdependent, systems-based, adapted, optimized, and values-based. It’s also life-supporting when it tends, nurtures, cares for, motivates and encourages others. This reflection brought me to a place of creative inspiration. I’m interested in exploring a restorative structural fabric that encompasses all of life’s principles. It would be modular, flexible in all dimensions, could function as a skin or a structure, and could be programmed for form and function. This is based on the structural network of nutrient transport in leaves. I’ve included some diagrams I’ve been working on during and after my BCI session this week. DATE: SUNDAY JANUARY 29, 2017. LOCATION: MONTARA STATE BEACH, MONTARA, CALIFORNIA. After reading How to Intervene in a System, I began to ask myself a few questions. The answers to these questions change over time, so although I may have asked myself these questions before in the past, it doesn't hurt to ask them again and see if I am still on track with my values, or if I am growing and adapting. The most effective place to intervene in a system is at the paradigm level. What forms my paradigms? What limits me? What leverage points do I have? 1. The mindset or paradigm - the lens through which we see the world. The sky is an integral part of our biome. Its components shield us from the sun's extreme heat, brightness and radiation and from any space debris that usually burns up in the atmosphere before it reaches the ground. The sky represents faith and religious systems, a thirst for knowledge and exploration, and infinite possibilities. It reminds us of our smallness, and our inter-connectedness. It reminds me of the future; the places I will go. The sea represents the will and ingenuity of humanity. There was a time when it was very difficult to overcome this perceived boundary. The sea reminds me of perception - the ideas that way have can change by increasing our understanding. It reminds me of the past; the places rom which I came. Sand has this incredible tactile quality. It represents how matter changes over time and we can feel it slipping through our fingers and under our feet. Sea shells, from years and years of processes are ground to tiny, shimmering bits. Any stage of life is visible in sand, from the very beginning to the very end. It reminds me of the present; where I am right now. Date: Friday January 27, 2017. Location: Langton Street & Harrison Street, San Francisco, California. Weather: Cool, dry, overcast with lots of sunshine and warmth. This reflective session was done along my daily foot-commute from my car to my office. I plucked this terrible looking, dust-covered leaf and noticed, after I picked it, just how delicate and fragile it was. As I tried to remove some of the dust off its side, I felt it cracking under the gentle pressure of my index finger. How could something so tender survive in this filthy, industrial landscape of downtown San Francisco? I turned the leaf of in my hand, more carefully this time, and noticed that there was something cocooning on the underside of it. It's amazing to see that trees and other natural life, those seen and unseen, can adapt to these harsh conditions. I can barely get my orchids to come back each year and they sit in the same spot all year, with similar controlled conditions. I wonder... if this tree can survive on a busy street, how resilient and adaptive are the plants we eat? Do these edible plants need to be grown on a farm and surrounded by pesticides which are not only killing pests but humans as well or could we keep these plants indoors and hereby grown only what we need? What if our buildings not only supported the food energy that we need, but also mirrored this urban tree in the aforementioned functions of adapting behaviors, optimizing space and materials, and coevolving? If a building adapted behaviors, it could relate to people and the planet differently, and be more resilient and adaptive. If a building optimized space and materials, it would not create waste, and if it did create waste, that waste would become food or energy for another living thing. If a building coevolved, its systems would evolve along with people and nature instead of requiring updating in order to avoid becoming obsolete. What are the systems in the built environment that prevent structures from adapting, optimizing and coevolving? What If We're All Just Hairy Rocks? What if... we're not as individual as we like to think we are? Then what is it that connects us? I don't know, but I'd love to spend the rest of my life designing spaces that help answer this question. Date: Wednesday January 25, 2017. Location: 7th Street & Harrison Street, San Francisco, California. Weather: Cold, sprinkling rain, windy, cloudy. Well the only thing worse than not working is being in a job you hate. Of course, I've never hated a job before, but I've gotten bored many, many times. I've also taken lackluster jobs just to continue working. I've also found reasons to leave boring jobs, and then got bored not working and taken up other jobs to ease the boredom. Well, this time around I thought about a lot of things. You see, I had a lot of time to think. I evaluated my personality, the ideal environment for me, the type of people I get along with, and the skills and traits I like to use at work. I reviewed my work experience comprehensively and looked for themes in interest, and in dissatisfaction. More than anything. I wanted to do something I loved, which is nearly anything related to design and building. I also wanted to be around people who were not afraid to see me grow. No! I wanted to be in an environment where I was encouraged to grow, surrounded by others expecting the same! A place where I could plant myself for a time. and thrive. And so, I began to look for work. I was mentally ready to go back to work, but I wanted to be particular about everything from the team, to the culture, the pay, the benefits, the workspace, the variety in tasks, and the opportunity to grow in responsibility. With this very lofty list of ideal attributes, I found a place and team that I instantly connected with on all of these levels. At any other time in my life, I doubt I would have been able to identify and appreciate the opportunity in front of me, but because of what I knew and where I was, I jumped at it and have not looked back. It's incredible when you acquire new information and you wait for your life to adapt to this new realization. It doesn't happen the way one may expect. I thought that I'd stay at my previous company for the duration of my time at MCAD, at minimum. And even though the work we did there was not sustainable, and even though the culture itself was not sustainable, I just assumed that because it fit my life two years ago that it would continue to work for me. In time I outgrew my role, and ended up with a new, more appropriate, and of course more sustainable, opportunity. Sometimes we just need to go to a different place for a time, to change our environment or the ingredients in our life for a different experience. I've heard a saying that it's not the flower that is the problem, it's the environment. "When a flower doesn't bloom you fix the environment in which it grows." A seed will grow under the right conditions. A seed is always a seed, no matter where it is. If you're not growing, evaluate, and change, your environment. Don't be afraid to expect the best, to keep moving, and to keep growing. What if Your City Could do This? Anger is a powerful emotion, it can be an intense source of energy, and it can even be used to fuel good. However, it's a place one should visit, not live in. When anger becomes the house you live in, you can quickly begin to harm yourself, those you care about, and even strangers. When processing new information, or entertaining ideas different from our own, we can either be mature or childish. The mature activist listens, reasons, seeks to understand, and looks for common ground to create and maintain dialogue. The childish activist quarrels, nitpicks, criticizes, divides, and forces his or her beliefs onto others with self-righteousness and zeal. This is extreme. The extremist is unwavering and judgmental. The extremist is not persuasive or effective. Have you found yourself frustrated, misunderstood and/or isolated? Have you found yourself unable to respect or value people with beliefs different from yours? You could be living in angry house that you built for yourself while you were hurting. If that's you, simply leave that house, find someone to embrace, and continue to look for creative solutions to life's opportunities. We're better together. And remember, you're not done working until you're dead, so get to it! For a lot of people, 2016 was a "terrible" year. Some have referred to it as "the worst year" in human history. I am going to have to agree to disagree. Sure, some things did not go as planned for some people, me being one of them. But 2016 was a time to reflect, appreciate and refocus for all of us. I'm an eternal optimist, and I've been in a group of thinkers and educators who have predicted 2016 events for some time now. Even if 2016 was hard to handle, it's up to us as designers and sustainability advocates to make 2017 better. And if 2016 was so bad, it shouldn't be that difficult to make 2017 better. We can't rely on others to make things happen for us. We have to get involved. We must be proactive about our education, career management and personal branding. We must be more careful with what we share on social media. We've got a lot of work to do, but we absolutely CAN do it! We know what's wrong with our political system. We have access to so much information and technology. We are able to instantly crowd source solutions from diverse demographics and engage dissonant or otherwise unengaged young people. We know that we must take care of our aging and elderly, tapping into their knowledge bases and providing them opportunities to realize their continued relevance. We must plan for 2017, remain optimistic, take charge of the big problems, and never stop growing. 2016 was a difficult year for me as well, but these difficulties simply proved to be more opportunities for me to rise above circumstances and setbacks and dig deep to find out what is truly of value to me. 2016 marked completion of my first year of graduate studies, an experience that never ceases to humble me. It marked a project transition, where I left a project that I had worked on for two years. It also marked the reinvention of Biotic Design, an idea that was birthed during my undergraduate studies at California College of the Arts nearly 8 years ago. 2016 reminded me that we are all connected, and we are all in this together. 2016 reminded me truly, that ANYTHING IS POSSIBLE. What good did 2016 bring you? What areas did you succeed or grow in? What goals did you accomplish? What personal progress did you make? Remember: there are always ways to make a difference and THRIVE. Stay focused, remember what's important, and NEVER EVER give up. So I don't live in San Francisco, and I never will. I did, however, go to college in San Francisco for 5 years and I spent many nights at school so I almost lived there. After school I ran a small business in the City for 3 years. San Francisco is a city known for cutting edge thought, design, technology and culture. It’s a very “green” city and is currently undergoing a major infrastructure revitalization effort that incorporates low-impact design and green infrastructure. Culturally, it is a global melting pot, and it is a port city. This makes it socially, economically and ethnically diverse city. It is also a strong local art and industry hub. However, real estate inflation and over-population are forcing a migration of some of the most talented creatives out of the city and into neighboring cities like Oakland. California produces most of the country’s agriculture and much of its meat. San Francisco has a wealth of resources from which to draw, including all local American food, and tons of imported food from Asia and Europe. Local Californian cuisine is fresh, most of it is considered nouveau-French, and in the spirit of Napa Valley, we have everything that Europe has and much more of it. The food here is rich, fresh, high quality, and varied. San Francisco is very close to Silicon Valley, only a 45-minute drive without traffic. Many bright and creative types flock to Silicon Valley from all over the world, for work, education and simply to immerse themselves in a unique culture. A lot of these migrants desire to live in San Francisco because it is such a vibrant, open-minded and diverse city. Many people find it hard to leave, though the cost of living is obscene. The City also has a large entertainment industry, a significant financial district, and a well known arts district. The City is constantly undergoing construction, either in the form of revitalization efforts, upgrades and maintenance to infrastructure, or new projects. Wages are higher in the City, as is the cost of living. San Francisco is a city that is friendly to small businesses and advocates, protects and encourages the growth of its local economy. Some of the City’s few remaining historic working class neighborhoods are under threat of gentrification, but this is a problem many large cities face. San Francisco utilizes Recology, a state of the art zero waste recycling center. As California just became the first state to ban plastic bags, San Francisco paved the way by being one of the first cities to ban plastic bags. It has also become one of the first cities to ban plastic bottles. The Department of Public Works, The Public Utilities Commission and the Department of the Environment all have green initiatives and sustainability plans that set lofty goals for public work. The San Francisco Green Building Code, adopted in 2008, requires LEED certification for new construction and renovations on all public projects. The City is also a hub for professional organizations of nearly every discipline. Many public and private institutions of higher education exist in the City, and the City is known for incredible college prep and alternative education models. Various immersion and bilingual schools also abound in this culturally diverse city. Public transportation is huge in the City, but it’s also a bit outdated and disjointed. There are many areas in the small city that public transportation will not reach. Traffic is very bad, and riding a bicycle is dangerous, but thankfully pedestrians have the right-of-way, and it is a walkable city. Designated bicycle paths permeate the city, and greenways and green corridors connect neighborhoods and people. The case study for this post's topic, social sustainability, evaluates the world's largest pro-bono design marketplace, The One Plus (1+). "1+ connects nonprofits with pro bono architecture and design services. The first and largest pro bono service network within the architecture and design professions, 1+ challenges the design community worldwide to dedicate one percent or more of working hours to pro bono service. 1+ is the flagship program of Public Architecture, a 501(c)(3) nonprofit. Public Architecture’s mission is to provide the network and knowledge necessary to use design as a tool for social gain." The design community already struggles with finding sustainable ways to provide services and make money. It's also a highly competitive field, with many professionals able to provide the same services. In a search for nonprofit or pro-bono design services, I did not find many firms. Many firms will aim to be socially sustainable, but information on how this is achieved is lacking. There are not many Architects Without Borders chapters, the San Francisco based Architecture for Humanity recently went bankrupt and is now defunct, and finding published information on projects from either is difficult. What is most worrisome to me is that data and reporting is even more scarce. Finding 1+ is exciting because it is a "design marketplace" that seeks to bridge the gaps between designers and the underserved. I see a significant potential for reporting through this platform, and am excited to see how firms of various sizes, from single proprietorship to large scale are getting involved. As there are not many similar entities to evaluate, please take my critique of 1+ in context: they are doing good and it is a mighty fine start. We need more entities like 1+. The are certainly a part of the solution. The way that 1+ makes the world a better place is simple: it provides a platform for willing designers and searching non-profits to connect. It also recognizes firms who contribute to pro-bono and nonprofit design work. Finally, 1+ promotes socially sustainable and equitable design by creating a dialogue. Is 1% of our time good enough? What would the world, and the profession, look like if we gave 50% of our time? The key take away from 1+ is that being socially sustainable can be as simple as making connections and fulfilling a need. Collectively going with the flow seems to be the antidote to individually trying to control each other. But just how exactly do we inspire, influence, and infuse one another when we are all on such different paths? Inclusion is one way we can cross the great divide. Another way is by being patient and lowering our expectations. Young companies, fast companies, entrepreneurs, and the startup mentality has shown me in the past 20 years that a leader can be anyone with an idea. It takes much more than an idea to lead, and it takes even more to stand the test of time and weather the storms of the economy, including recession, but ideas, energy and dedication can take us quite far. Leaders must be prepared for the ups and downs, the challenges, the failures, and the learning curves, while on their journey. I was inspired by a great leader once. It was her calm demeanor, combined with her contagious zeal and passion, and her incredible humility and approachability that drew me in an even made me want to possess more of those qualities. Of course I believe the way we see others (and the world) is ultimately a reflection of how we see ourselves. That being said perhaps it was not her personality that I saw, but my values instead. This leader fought diligently and creatively to cultivate a forum where other likeminded, passionate creatives could come together, hone their craft, and uplift one another to promote sustainability. It was the way in which she believed in her cause that made me believe even more in mine. I am absolutely a hero, and it is EXHAUSTING. It is only inspiring for a short time, until one gets to know me. Then it is frightening, annoying, and eventually frustrating to those who care for me. I will not receive help, I will not quit until I fall down, and if I lack support I will drive my heels even deeper into the ground until I either meet my objective or pass out. When I find myself alone, angry, and being heroic, I must take a deep breath and call to mind that inspiring leader and the calm and confidence she exuded. Be inspired as easily by anecdotal narratives as you are by quantitative data. Be stirred by a person’s experience and interpretation, and just as quickly be persuaded by studies, tests, hypotheses, and research. Learn to cultivate your intuition. Commit to your objectives. Do not tire until you have reached the end. Remain skeptical, especially when bombarded with conflicting messages. Do not give up on answering life’s most difficult questions. Ask the right questions, or those which lead to dialogue and mutual understanding. Maintain productive dialogue in all personal and professional relationships. Dedicate yourself to a lifetime of learning. Information processing and critical thinking help when presented with new or challenging information. Avoid constantly battling information and stimuli overload. Take breaks when needed. Get in touch with nature, wildlife, being outside, natural sleep patterns, and learn how to be content in the absence of media and technology. Recharge when drained. Rest when tired. Spend time with yourself so that you know yourself. 10. The art is not something you apply to your work. The art is the way you do your work, a result of your attitude toward it. Design is a full time job. It is the way you look at politics, funny papers, listen to music, raise children. For more from Eames, check out An Eames Anthology on Amazon.com. All issues get my attention but social and environmental issues are the most compelling as I feel these are the issues to which I am best equipped to posit solutions. Injustice angers me. Complaining angers me. Being negative and refusing to take the time to suggest solutions anger me. Lone rangers inspire me. Simple acts of justice inspire me. Volunteers inspire me. Teachers inspire me. Parents inspire me. Children inspire me. People in service inspire me. People with passion inspire me. I am easily inspired. When I first began my graduate program in Sustainable Design, I thought I had a lot to offer the classroom. I thought I had a lot of experiences, personal and professional, that created value in me as a student. I also thought that I had a unique perspective that made my thoughts and outlook on life more original or more varied than the average American's. I have had a hard time “fitting in,” in my work and personal life. I have been viewed as different, unique and original. However, when I met my classmates and instructors, I realized that we all possessed these other-worldly attributes. Now I see that I am in like-minded company. Now I have found a community in which I belong. The commitment to learning, offering solutions, and taking on humanity's most difficult challenges... these are the threads that weave throughout us. We are activists, humanitarians, designers, educators, and lifelong students. We are committed to bettering ourselves, one another and the planet. I see the sustainability community as a place where we go to recharge our batteries so we can go back into the world and solve problems. Finding congruency in my work, life and design philosophies will help me to become a more authentic leader. What is you work philosophy?